The big dog is a marvel of nature. Here’s proof: Zeuss, a Great Dane, is the current Guinness Book record holder for tallest dog – at 44” or 3.6’, he could stand eye-to-eye with a four-year-old child. The biggest, as in heaviest, record holder was an English Mastiff with the unusual name of Aicama Zorba. At his weightiest, Zorba registered a whopping 343 pounds. 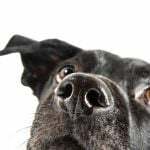 But even if your larger pooch doesn’t tip (or topple) the scales, you know firsthand that big dogs often have different play needs than their pint-sized peers. They may or may not be rougher in their play nature, but their teeth and jaws, legs and paws are still bigger, taller, wider and stronger, meaning different sizes and types of toys and puzzles are in order to keep them optimally stimulated both mentally and physically. In this post, we are going to look at some of the hands-down best treat-based and non-treat-based puzzle toys for larger dogs. If you have favorites you don’t see listed here, we’d love to hear about them! Check Out the Buster Cube! 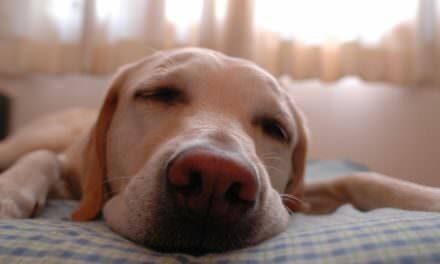 What is harder than leaving your precious pooch alone for the day? Probably not much – and the experience is no picnic for your dog either! Some breeds are particularly known for separation anxiety in dogs, but luckily there is a treat dispensing puzzle toy that can keep your pup occupied for the day without buckling from the chew power. A treat toy that has outlasted pit bulls, retrievers, French bulldogs, standard Poodles, shepherds, Labradors and other known vigorous chewers. The key to its longevity (read: indestructibility) is the size. It is simply too large and awkward for most dogs to get their jaws in that perfect position to deliver the chomp o’ death. Square shape with small openings makes it more challenging to get the treats out. Shape discourages demolition of the toy itself. 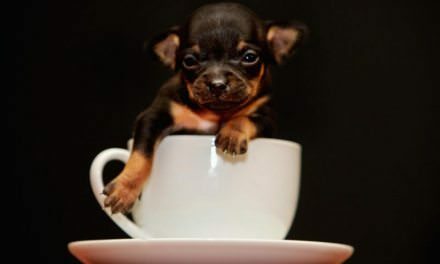 Can hold about 1 cup of food. This magic mushroom is a durable treat dispenser bar none. Made by PetSafe, this toy encourages your pup to interact vigorously for treat rewards. Specially designed for dogs 20 pounds and up. Will dispense treats in a random pattern so great for even very high IQ dogs. There are also extra windows you can adjust for more challenge. If your dog gulps food like it is the Last Supper, the Mushroom can be a great tool for weight control. Stuffing Your Dog CAN Eat! 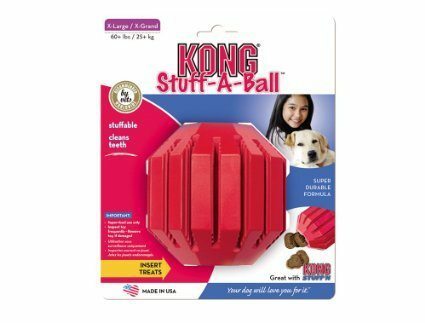 Kong is perhaps the most universally loved and trusted by dog parents and pooches alike. With tons of challenging toy configurations and super-tough materials, your biggest challenge can be to choose which Kong toy you think your pup will like best! But many big dog mamas and papas agree that the Kong Stuff-A-Ball can go head-to-head with the smartest, strongest chewer and still stay standing. This toy comes in small, medium, large and extra-large sizes. You can stuff and then freeze the whole ball for extra challenge. Satisfies your dog’s urge to “get the stuffing out” safely. 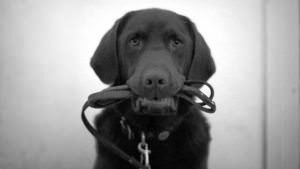 The design naturally keeps your dog’s teeth and gums cleaner. 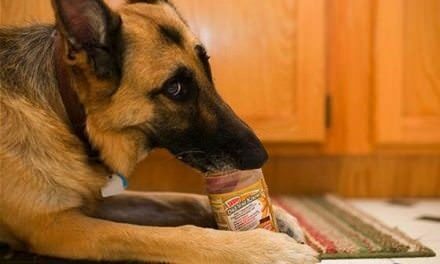 It is easy to stuff the treats in! It bounces, wobbles and rolls to keep the game going. 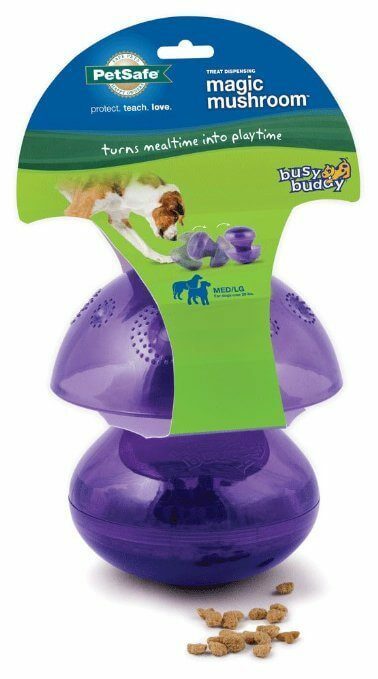 Active Dog Toys makes a bubble blower that is designed especially for dogs with a big appetite for vigorous outdoor play. 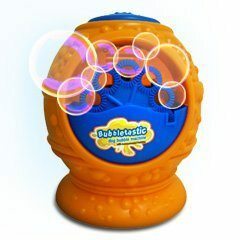 How does the bubble machine get your dog to play? The bubbles smell like BACON. As the bubbler blows out bubbles, your dog will chase and try to “catch” them, offering physical and mental exercise (and giving you a welcome break from “go fetch” and “tug-of-war”). Because the toy isn’t as tough as some, it is best to place it up higher or out of your dog’s sight before getting the bubbles going. AAA batteries do not come with it, but an 8 oz bottle of bubble liquid does. Offers all the in(scent)ive of a treat-dispensing toy without the weight gain risk of actual treats. There is just no way to talk about puzzle toys for any size or weight or age of dog without including Nina Ottosson’s special brand of interactive treat-based puzzle toys. Her toys come in plastic, wood or rubber composite and are certified eco-friendly, non-toxic and safe for dogs. 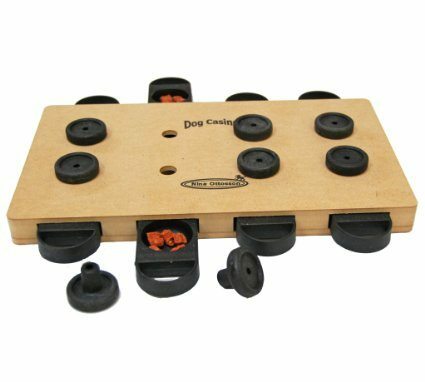 While it is hard to select a single “best” toy from the Ottosson lineup, one toy that seems to make the big dog interactive puzzle toy list quite reliably is the Dog Casino. But be sure to check out the rest of her line on her website (and since her company is located in Sweden, if for any reason you can’t find the toy you want on Amazon, you can use the reseller locator tool to find out where to buy it in your geographic area). Your dog really has to work for the treats by pulling out all the different little flaps. 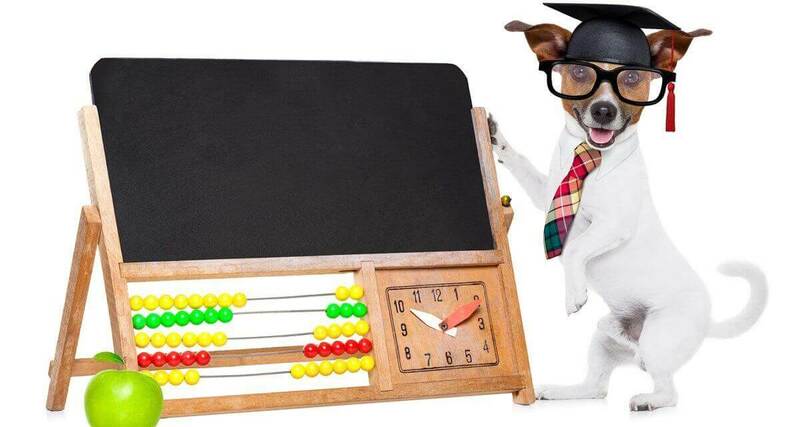 Average difficulty level (Ottosson level “3”) which is especially good if your dog is new to puzzle toys! What is Wobbly and Giggly and Wags All Over? 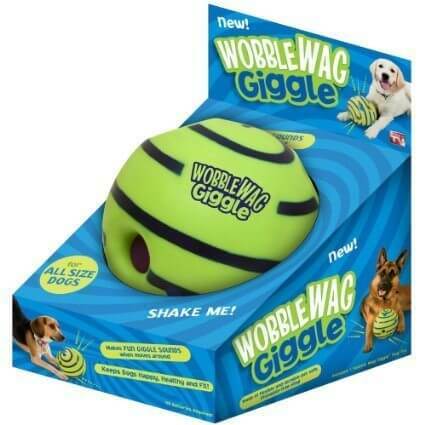 Why, the Wobbly Wag Giggle Ball, of course! This interactive ball is great for large dogs of any age and energy level. 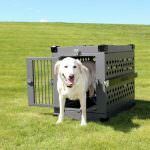 The material is certified as safe and non-toxic and it is especially made for dogs that weigh 40 pounds or more. 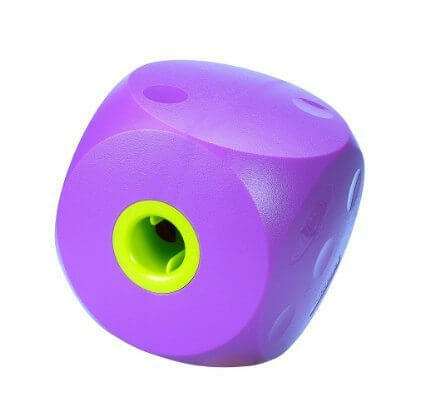 Makes a variety of intriguing sounds when your dog shakes or rolls it. Has multiple grip centers to encourage more play. No batteries needed – the sounds are made through a series of tubes. Can be used indoors and outdoors safely. More About the Wobble Wag! Just the sight of that bushy tail… the pull to CHASE THE SQUIRREL often appears irresistible. 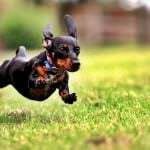 But it is not always the right moment to give chase, especially if the weather is inhospitable or you are gone with your pooch locked safely indoors. In this case, what better way to while away the hours than a set of indoor squirrels in their own interactive maze? Toy comes in junior, large, jumbo and ginormous sizes. The plush “trunk” is designed to be as durable as any plush toy can be. 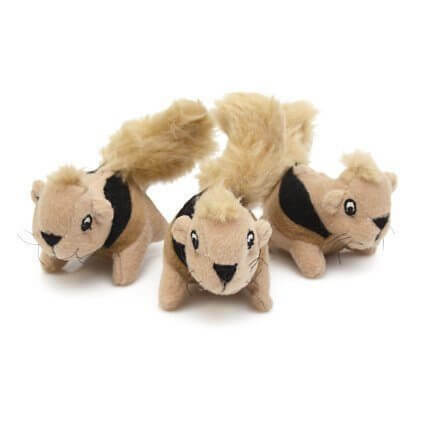 Ginormous size comes with 6 plush squirrels (the junior, large and jumbo sizes each come with 3 squirrels). Get My Dog the Squirrel! Before closing out here, I have to be honest. It is really, really, REALLY hard to pick the “best” interactive puzzle toys for big dogs. In part, this is because chew style and power must be factored in (some dogs, as we all well know, can destroy anything, anytime, anywhere, in moments, and no matter how many times “indestructible” is stamped on the outside). 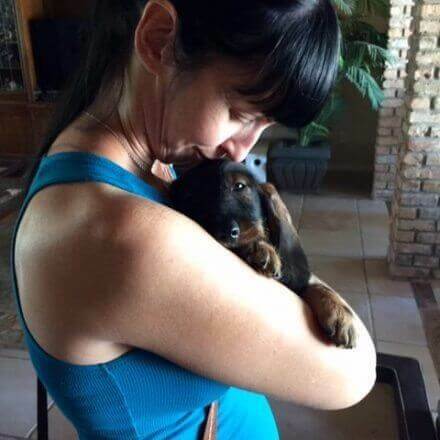 Also, just like us, our dogs will like what they like and dislike what they dislike, and only time plus trial and error can accurately determine which is which. So if you and your pooch are a new pair, you may want to make a trip or two to the thrift center or pet store and see which toys generate the most interest! But once you’ve got a sense of what your furry canine sidekick seems to really like we think these big dog puzzle toys might have a lot to offer!